Mr. Magee is back! The beloved character has gone camping, has been down to the sea, and now, at long last, he learns to ski. This delightful book of warmth and humor from Maine author and illustrator Chris Van Dusen will be worn threadbare by Mr. Magee fans on couches and at bedtimes across Maine. 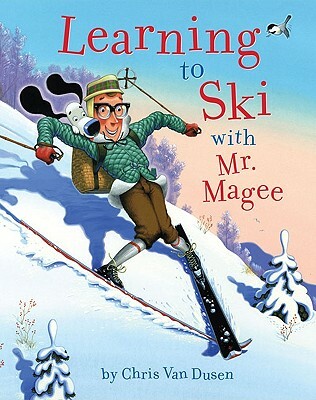 One winter morning, Mr. Magee and his little dog, Dee, head out bright and early to learn how to ski. But what begins as a pleasant day in the snow quickly goes downhill when a run-in with a curious moose sends them flying through the air and hanging above an abyss! How will Dee and Magee find their way out of this snowy situation? Chris Van Dusen, the creator of Down to the Sea with Mr. Magee and A Camping Spree with Mr. Magee, has craftedyet another fun-filled adventure for Magee fans old and new. Chris Van Dusen has created illustrations that have been published in magazines and books and printed on T-shirts and greeting cards. He lives in Maine with his wife, two sons, and, naturally, a dog.